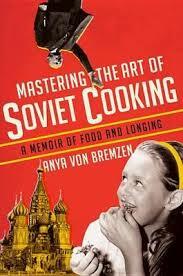 There are two ironies in the very title of Anya von Bremzen’s Mastering the Art of Soviet Cooking. The first and more obvious irony is that, for most Soviet citizens during much of the Soviet period, the culinary art that needed to be mastered most was the art of obtaining food. The second irony, which can only be grasped by anyone who reads this marvellous book, is that cooking is really just a thread onto which she strings a family memoir and a history of the Soviet Union like jewels on a necklace. The book’s framework is the recreation by von Bremzen and her mother, Larisa (the true hero of the book) of a representative meal from each decade of the Soviet period, commencing with a celebratory end of era Romanov meal. Onto this skeleton, she then weaves the story of her extraordinary family together with a more general history of the Soviet Union and a more detailed analysis of the food and cooking of each decade. I will confess that, with both food and Russian history being particular interests of mine, von Bremzen would have struggled to lose my interest but there was never any danger of that occurring given the quality of her storytelling. It helps that the two branches of her family contain a wonderfully eclectic mix of characters from Larisa, who appears to have been a natural born dissident to her grandfather Naum, a senior Soviet intelligence officer throughout the Second World War (or Great Patriotic War as it’s known in Russia) and from her father, Sergei, an unreliable spouse who at one time was responsible for monitoring the colour of Lenin’s embalmed corpse to her great great grandmother Anna Aleevna, a fiery idealist who fought for women’s rights in Turkestan in the early days of the Soviet Union but who ended her life broken and disowned in Siberia, having been sent to the gulag by Stalin. Mastering the Art of Soviet Cooking reads like a Tolstoyan family epic, sweeping across time and geography and tracing out the lives of the vivid individuals who make and made up the author’s extended family. Her family story takes us from the Caucasus to the Ukraine to meet some of her Jewish relatives and their heritage and from her various family homes in Moscow to the siege of Leningrad in the Second World War. There’s also something telescopic about the way that Von Bremzen combines this panoramic story with intimate and detailed family stories such as the story of how Larisa lost the ration book during the Second World War – an event that usually spelt starvation and death for the family concerned – and learnt how to deal in the black market or the incredible story of Naum’s narrow escape from arrest during one of Stalin’s purges. Instead, the central food-related themes are those of the struggle to obtain food: the rationing, the queuing, the failures of central planning, the Krushchevian obsession with corn, the near starvation of the Yeltsin years and the actual starvation in the Ukraine following collectivisation. It’s the impact of Soviet totalitarianism on even the basic social structures of eating with the communal apartments and shared kitchens and the public canteens. I think that the use of food as the central thread by the author is beautifully appropriate, given the importance that obtaining enough to eat assumed for most Soviets. But von Bremzen goes further, linking individual Soviet leaders to particular foodstuffs and drawing from this parallels with their leadership. So, we have Stalin’s championing of Soviet “champagne”, an ersatz product that was designed to demonstrate abundance and that Soviet quality of life was high – when the reality was one of fear, shortage and lack of quality. Khrushchev is, inevitably, associated with corn and his failed attempt to use it as a miracle grain to solve the problem of poor harvests. Like Khrushchev himself, it was doomed to failure. In many ways, food embodies some of the key historical themes of the Soviet Union – from the brutal farm collectivisations and requisitioning of Lenin’s times, to the rationing and hunger of the Second World War and from the failures of the Khruschev years to provide the consumer goods to Russians that were becoming ubiquitous in the US to the quixotic and disastrous anti-alcohol policies of Gorbachev that would contribute to his unpopularity in the Soviet Union and its ultimate demise. Stalin looms large over proceedings in Mastering the Art of Soviet Cooking and I find it interesting that, no matter from what angle one views the Soviet Union, the vozhd becomes the dominant presence, even more so that Lenin himself. One of my favourite stories in the book is of Stalin sending his faithful sidekick Anastas Mikoyan to the US to investigate what the American s are eating and how he comes back to introduce the hamburger (sans bun) and ice cream to the Soviet people. It’s an almost picaresque story that I found reminiscent of the episode in Adam Johnson’s The Orphan Master’s Son where a North Korean delegation makes a trip to meet a US senator at this ranch in Texas. The story itself is good but, as with all the stories in Mastering the Art of Soviet Cooking, Von Bremzen tells it well. Since her move to America, von Bremzen has carved out a successful career as a food writer and has won two James Beard awards for previous books. She deserves to win further accolades for this one. I’d like to thank Crown Publishers for sending me a review copy of Mastering the Art of Soviet Cooking. I just read a brief review of this in a magazine, which caught my attention - but your much more expansive review has convinced me to add this to my list - and recommend it to a friend whose passion is Russian history.